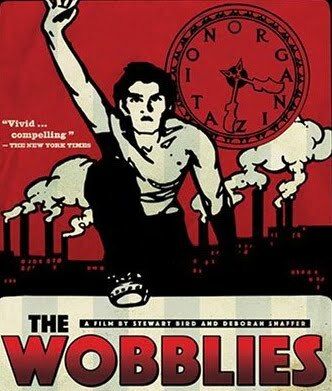 The 1979 documentary film The Wobblies provides an overview of the rise and fall of the IWW (Industrial Workers of the World), complete with archival footage, loads of interviews, Wobbly art and songs. This 1979 documentary established a new, primary-research modus for historical nonfiction—no narrator, no authorial perspective, just original documents and witnesses—but its subject matter was, and still is, its most radical characteristic. By the ’70s American culture had been made to forget that the Industrial Workers of the World had ever existed, just as in the century’s first decades the segregated union utopia was condemned, brutalized, legislated against, campaigned against, and demonized. Today, things haven’t changed much—Deborah Shaffer and Stewart Bird’s film stands among a scant handful of books detailing the labor movement’s astonishing power and growth, its newspapers and songs and sheer membership, as well as the sickening history of suppression, murder, and criminal injustice that was brought to bear upon it. (Don’t forget Warren Beatty’s Reds, shot around the same time and with several of the same elderly survivors.) American high schoolers should have to see it to graduate, but then so much of what they’re taught would evaporate as a consequence. Released with new interviews and old anthems, and alongside nine other classic docs in the “Docurama Film Festival I. The Wobblies (Full Documentary) from Libcom Dot Org on Vimeo. Actually the movie was highly manipulative and represents the makers trotskyist perspective. For example Minnie Corder, the Lawrence, MA striker is edited asking something like "what ever happened to the IWW" but she was sitting on the IWW executive board at the time of the interview. All the old timers I knew who were interviewed loathed the film and hated the filmakers for their manipulations. I'm glad the film was done and it's been about 4-5 years since I've seen this, but I remember it not even acknowledging the continued existence of the IWW. Now at that time, they were pretty small (I'm assuming anywhere from 200-700 members) but as this book shows, they were involved in strikes at the time. I didn't know about what fnbrill said, that's messed up. OK, looks like I'm wrong about Minnie Corder, she's not in the film. I do remember allot of hard feelings about the film from within the IWW. Especially some of the editing of interviews. I'll try and ask some of the older-timers than me about and get the story straight. WCSO, ya still going book recommendations?